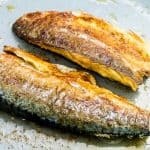 Pro-tips on how to pan-fry mackerel. Clean the fish and take out its innards. Soak the cleaned mackerel in rice water (or milk) for 10-15 minutes. Then rinse the fish off under cold water. Place the fish on a few paper towels. Pat it down dry. Then mix the Flour (1T) & Curry powder (1T) together. Sprinkle the batter over the fish and coat both sides. Make sure to give the fish a few gentle pats to take off extra batter. Put frying pan on a medium-high heat. Place in oil. Once it's hot, place the pieces in skin-side down. Let it grill for 1 minute, until the skin turns crispy. Once it's crispy, flip it over to the otherside. Reduce the heat to a low. And let it fully cook through for 3-5 minutes. Once crispy on both sides, take out the pan and plate. Please be careful of fish bones!